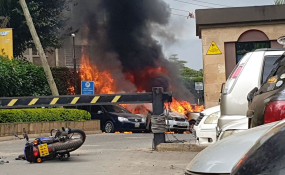 The Foreign Correspondents’ Association of East Africa (FCAEA) would like to express its deep condolences to the people of Kenya for the appalling terror attack on the Dusit D2 Hotel on Riverside. We understand these attacks send shockwaves not just through the communities of those directly affected, but across the city and the country as a whole, and can have a traumatising impact on many citizens. As journalists our job is to make sense of these horrific acts. There are risks in covering bombing attacks and no coverage is ever perfect. Nevertheless members of the FCAEA endeavour to provide facts on the ground and keep people informed of the aftermath of such bombings. Social media has been a great help in providing information and bringing loved ones together in the aftermath of this attack, but it has also been used as a channel of anger against journalists who work tirelessly, and at personal risk, simply to tell the story. The FCAEA condemns the extremely aggressive and personal attacks through social media against Kimiko de Freytas-Tamura of the New York Times for photographs selected not by her, but by her editors in New York, and used alongside her reporting. The choice of images used in a time of tragedy is a difficult balance and something editors in newspapers, television and online media constantly battle to get right. Different publications follow different guidelines. We absolutely defend the rights of readers anywhere to protest what they see as offensive editorial decisions. That is part of an essential conversation. But we are disturbed by the personal attacks on Kimiko and a general stoking of anger against foreign journalists working in Kenya. At this upsetting time we will continue to cover these stories, to demand accountability of those responsible, and ask all the questions people would like asked of the authorities. But we ask that hate speech is not used against us through social media, that we do not become a punching bag for understandable anger and frustration, and we ask that citizens support us as we strive to truthfully and accurately report events in Kenya. Copyright © 2019 Foreign Correspondents Association of East Africa. All rights reserved. Distributed by AllAfrica Global Media (allAfrica.com).